The American Quarter Horse, or Quarter Horse, is an American breed of horse that excels at sprinting short distances. Its name came from its ability to outdistance other horse breeds in races of a quarter mile or less; some have been clocked at speeds up to 55 mph (88.5 km/h). The American Quarter Horse is the most popular breed in the United States today, and the American Quarter Horse Association is the largest breed registry in the world, with almost 3 million living American Quarter Horses registered in 2014. The American Quarter Horse is well known both as a race horse and for its performance in rodeos, horse shows and as a working ranch horse. The compact body of the American Quarter Horse is well-suited to the intricate and speedy maneuvers required in reining, cutting, working cow horse, barrel racing, calf roping, and other western riding events, especially those involving live cattle. The American Quarter Horse is also shown in English disciplines, driving, and many other equestrian activities.. In the 17th century, colonists on the eastern seaboard of what today is the United States began to cross imported English Thoroughbred horses with assorted "native" horses such as the Chickasaw horse, which was a breed developed by Native American people from horses descended from Spain, developed from Iberian, Arabian and Barb stock brought to what is now the Southeastern United States by the Conquistadors. One of the most famous of these early imports was Janus, a Thoroughbred who was the grandson of the Godolphin Arabian. He was foaled in 1746, and imported to colonial Virginia in 1756. The influence of Thoroughbreds like Janus contributed genes crucial to the development of the colonial "Quarter Horse". The breed is sometimes referred to as the "Famous American Quarter Running Horse". The resulting horse was small, hardy, and quick, and was used as a work horse during the week and a race horse on the weekends. As flat racing became popular with the colonists, the Quarter Horse gained even more popularity as a sprinter over courses that, by necessity, were shorter than the classic racecourses of England, and were often no more than a straight stretch of road or flat piece of open land. When matched against a Thoroughbred, local sprinters often won. As the Thoroughbred breed became established in America, many colonial Quarter Horses were included in the original American stud books, starting a long association between the Thoroughbred breed and what would later become officially known as the "Quarter Horse", named after the 1⁄4 mile (0.40 km) race distance at which it excelled. with some individuals being clocked at up to 55 mph. In the 19th century, pioneers heading West needed a hardy, willing horse. On the Great Plains, settlers encountered horses that descended from the Spanish stock Hernán Cortés and other Conquistadors had introduced into the viceroyalty of New Spain, which today includes the Southwestern United States and Mexico. These horses of the west included herds of feral animals known as Mustangs, as well as horses domesticated by Native Americans, including the Comanche, Shoshoni and Nez Perce tribes. As the colonial Quarter Horse was crossed with these western horses, the pioneers found that the new crossbred had innate "cow sense", a natural instinct for working with cattle, making it popular with cattlemen on ranches. A photograph of Peter McCue, taken in Oklahoma around 1905. Early foundation sires of Quarter horse type included Steel Dust, foaled 1843; Shiloh (or Old Shiloh), foaled 1844; Old Cold Deck (1862); Lock's Rondo, one of many "Rondo" horses, foaled in 1880; Old Billy—again, one of many "Billy" horses—foaled circa 1880; Traveler, a stallion of unknown breeding, known to have been in Texas by 1889; and Peter McCue, foaled 1895, registered as a Thoroughbred but of disputed pedigree. The main duty of the ranch horse in the American West was working cattle. Even after the invention of the automobile, horses were still irreplaceable for handling livestock on the range. Thus, major Texas cattle ranches, such as the King Ranch, the 6666 (Four Sixes) Ranch, and the Waggoner Ranch played a significant role in the development of the modern Quarter Horse. The skills needed by cowboys and their horses became the foundation of the rodeo, a contest which began with informal competition between cowboys and expanded to become a major competitive event throughout the west. To this day, the Quarter Horse dominates the sport both in speed events and in competition that emphasizes the handling of live cattle. However, sprint races were also popular weekend entertainment and racing became a source of economic gain for breeders as well. As a result, more Thoroughbred blood was added back into the developing American Quarter Horse breed. The American Quarter Horse also benefitted from the addition of Arabian, Morgan, and even Standardbred bloodlines. Since the American Quarter Horse formally established itself as a breed, the AQHA stud book has remained open to additional Thoroughbred blood via a performance standard. An "Appendix" American Quarter Horse is a first generation cross between a registered Thoroughbred and an American Quarter Horse or a cross between a "numbered" American Quarter Horse and an "appendix" American Quarter Horse. The resulting offspring is registered in the "appendix" of the American Quarter Horse Association's studbook, hence the nickname. Horses listed in the appendix may be entered in competition, but offspring are not initially eligible for full AQHA registration. If the Appendix horse meets certain conformational criteria and is shown or raced successfully in sanctioned AQHA events, the horse can earn its way from the appendix into the permanent studbook, making its offspring eligible for AQHA registration. Since Quarter Horse/Thoroughbred crosses continue to enter the official registry of the American Quarter Horse breed, this creates a continual gene flow from the Thoroughbred breed into the American Quarter Horse breed, which has altered many of the characteristics that typified the breed in the early years of its formation. Some breeders, who argue that the continued infusion of Thoroughbred bloodlines is beginning to compromise the integrity of the breed standard, favor the earlier style of horse and have created several separate organizations to promote and register "Foundation" Quarter Horses. The American Quarter Horse is best known today as a show horse, race horse, reining and cutting horse, rodeo competitor, ranch horse, and all-around family horse. Quarter Horses compete well in rodeo events such as barrel racing, calf roping and team roping; and gymkhana or O-Mok-See. Other stock horse events such as cutting and reining are open to all breeds but also dominated by American Quarter Horse. Large purses allow top competitors to earn over a million dollars in these events. The breed is not only well-suited for western riding and cattle work. Many race tracks offer Quarter Horses a wide assortment of pari-mutuel horse racing with purses in the millions. 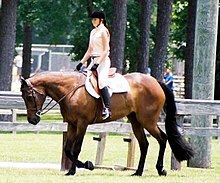 Quarter Horses have also been trained to compete in dressage and can be good jumpers. They are also used for recreational trail riding and in mounted police units. The Quarter Horse has a small, short, refined head with a straight profile, and a strong, well-muscled body, featuring a broad chest and powerful, rounded hindquarters. They usually stand between 14 and 16 hands (56 and 64 inches, 142 and 163 cm) high, although some Halter-type and English hunter-type horses may grow as tall as 17 hands (68 inches, 173 cm). There are two main body types: the stock type and the hunter or racing type. The stock horse type is shorter, more compact, stocky and well-muscled, yet agile. The racing and hunter type Quarter Horses are somewhat taller and smoother muscled than the stock type, more closely resembling the Thoroughbred. A stock horse is a horse of a type that is well suited for working with livestock, particularly cattle. Reining and cutting horses are smaller in stature, with quick, agile movements and very powerful hindquarters. Western pleasure show horses are often slightly taller, with slower movements, smoother gaits, and a somewhat more level topline – though still featuring the powerful hindquarters characteristic of the Quarter Horse. Horses shown in-hand in Halter competition are larger yet, with a very heavily muscled appearance, while retaining small heads with wide jowls and refined muzzles. There is controversy amongst owners, breeder and veterinarians regarding the health effects of the extreme muscle mass that is currently fashionable in the specialized halter horse, which typically is 15.2 to 16 hands (62 to 64 inches, 157 to 163 cm) and weighs in at over 1,200 pounds (540 kg) when fitted for halter competition. Not only are there concerns about the weight to frame ratio on the horse's skeletal system, but the massive build is also linked to hyperkalemic periodic paralysis (HYPP) in descendants of the stallion Impressive (see Genetic diseases below). A Quarter Horse warming up for hunt seat competition. Hyperkalemic periodic paralysis (HYPP), which is caused by an autosomal dominant gene linked to the stallion Impressive. It is characterized by uncontrollable muscle twitching and substantial muscle weakness or paralysis among affected horses. Because it is a dominant gene, only one parent has to have the gene for it to be transmitted to offspring. There is a DNA test for HYPP, which is required by the AQHA. Since 2007, the AQHA bars registration of horses who possess the homozygous form (H/H) of the gene, and though heterozygous (H/N) horses are still eligible for registration, altering that status is currently being discussed. Additionally all Quarter Horses born 2007 or later that are confirmed to be descendants of Impressive must carry a note about the risks of HYPP on their registration papers. Due to HYPP, the halter classes are undergoing significant changes. Halter classes are dominated by the Impressive bloodline. Impressive, a very prolific halter horse, brought to the stock breeds the muscle mass that is popular in halter competition today. This muscle mass is linked to HYPP, and as the condition is reduced within the breed, the style of horse in halter classes is also likely to change. Already there have been rule changes, including the creation of a "Performance Halter class" in which a horse must possess a Register of Merit in performance or racing before it can compete. Malignant hyperthermia. A causative mutated allele, ryanodine receptor 1 gene (RyR1) at nucleotide C7360G, generating a R2454G amino acid substitution. has been identified in the American Quarter Horse and breeds with Quarter Horse ancestry, inherited as an autosomal dominant It can be caused by overwork, anesthesia, or stress. ^ "AQHA Annual Report - 2014 Horse Statistics". American Quarter Horse Association. Archived from the original on September 23, 2015. Retrieved August 24, 2015. ^ a b Beckmann, Bruce. "Quarter Horses". Handbook of Texas Online. Texas State Historical Association. Retrieved 2006-05-30. ^ "American Quarter Horse." Britannica School. Encyclopædia Britannica, Inc., 2015. Web. 1 Jul. 2015. ^ Iowa Quarter Horse Racing Association. "Iowa Quarter Horse Racing Association 1976–2008". IQHRA Website. Iowa Quarter Horse Racing Association. Archived from the original on 7 June 2008. Retrieved 2008-06-11. ^ a b Close, Legends 2: Outstanding Quarter Horse Stallions and Mares. ^ Oklahoma State University. "Quarter Horse". Breeds of Livestock. Oklahoma State University. Archived from the original on 22 June 2008. Retrieved 2008-06-11. ^ Doan, Ryan; Cohen, Noah D; Sawyer, Jason; Ghaffari, Noushin; Johnson, Charlie D; Dindot, Scott V (2012). "Whole-Genome sequencing and genetic variant analysis of a quarter Horse mare". BMC Genomics. 13: 78. doi:10.1186/1471-2164-13-78. PMC 3309927. PMID 22340285. ^ "Breeds of Livestock - Quarter Horse — Breeds of Livestock, Department of Animal Science". afs.okstate.edu. ^ a b Kentucky Horse Park. "American Quarter Horse". International Museum of the Horse- Horse Breeds of the World. Kentucky Horse Park. Archived from the original on 2010-08-22. Retrieved 2008-06-11. ^ "Three Bars (TB)" (PDF). American Quarter Horse Association. Archived from the original (PDF) on 2011-07-07. Retrieved 2010-12-21. ^ American Quarter Horse Association. "AQHA Handbook of Rules and Regulations". SECTION II, Registration Rules and Regulations. American Quarter Horse Association. Archived from the original on 2008-08-13. ^ Foundation Quarter Horse Association. "Foundation Quarter Horse Association". FQHA Website. Foundation Quarter Horse Association. Archived from the original on 1 April 2007. Retrieved 2007-04-02. ^ Foundation Horses. "Foundation Bred Quarter Horses". FoundationHorses.com. Foundation Horses. Archived from the original on 26 April 2007. Retrieved 2007-04-02. ^ National Foundation Quarter Horse Association. "National Foundation Quarter Horse Association". NFQHA Website. National Foundation Quarter Horse Association. Archived from the original on 22 April 2007. Retrieved 2007-04-02. ^ Ross, Michael W; Dyson, Sue J (2010-11-11). Diagnosis and Management of Lameness in the Horse - E-Book. ISBN 978-1437711769. ^ a b Lynghaug, Fran (2009-10-15). The Official Horse Breeds Standards Guide: The Complete Guide to the Standards of All North American Equine Breed Associations. ISBN 9781616731717. ^ "National Saddle Clubs Association - Home". www.omoksee.com. ^ "The Canadian Quarter Horse Association". ^ American Quarter Horse Association. "Horse Statistics" (PDF). 2006 AQHA Annual Report. American Quarter Horse Association. Archived from the original (PDF) on 2008-04-14. Retrieved 2008-06-11. ^ "Registration rules" (PDF). American Quarter Horse Association. Archived from the original (pdf) on 2011-07-07. Retrieved 2010-12-21. ^ American Quarter Horse Association. "AQHA Handbook of Rules & Regulations 2008 Rule 205 (d)". AQHA Website. American Quarter Horse Association. Retrieved August 9, 2008. ^ Ellen., Frazel, (2012). The American quarter horse. Minneapolis, MN: Bellwether Media. ISBN 978-1612115436. OCLC 794554681. ^ M., Baxter, Gary (2011). Adams and Stashak's Lameness in Horses (6th ed.). Somerset: Wiley. pp. Chapter 2. ISBN 9780470961773. OCLC 927499663. ^ Aleman M (2009). "Malignant Hyperthermia Associated with Ryanodine Receptor 1 (C7360G) Mutation in Quarter Horses". Journal of Veterinary Internal Medicine. 23 (2): 329–334. doi:10.1111/j.1939-1676.2009.0274.x. PMID 19220734. ^ Valberg SJ, Mickelson JR, Gallant EM, MacLeay JM, Lentz L, de la Corte F (1999). "Exertional rhabdomyolysis in quarter horses and thoroughbreds: one syndrome, multiple aetiologies". Equine Vet J Suppl. 30 (30): 533–8. PMID 10659313. ^ Ulman, Katherine. "Equine Exertional Rhabdomyolysis". Summer 2000 Newsletter. Purdue University, Animal Disease Diagnostic Lab. Archived from the original on 13 May 2008. Retrieved 2008-06-12. ^ University of California – Davis. "Horse Coat Color Tests". Veterinary Genetics Laboratory. University of California at Davis. Archived from the original on 19 February 2008. Retrieved 2008-03-08. American Quarter Horse Association (1961). Official Stud Book and Registry Combined Books 1-2-3-4-5. Amarillo, TX: American Quarter Horse Association. Church, Stephanie L. (2006-09-14). "ACVIM 2006: Prevalence of PSSM in Quarter Horses". The Horse Online News (# 7628). Archived from the original on 6 June 2008. Retrieved 2008-06-12. Close, Pat (1994). Legends 2: Outstanding Quarter Horse Stallions and Mares. Colorado Springs: Western Horseman. ISBN 978-0-911647-30-3. Denhardt, Robert M. (1979). The Quarter Running Horse: America's Oldest Breed. Norman, OK: University of Oklahoma Press. ISBN 978-0-8061-1500-9. Sellnow, Les (2007-05-28). "HERDA: DNA Tests Available for Disfiguring Skin Disease". The Horse Online News. Retrieved 2007-05-07. Valberg SJ, Mickelson JR, Gallant EM, MacLeay JM, Lentz L, de la Corte F (July 1999). "Exertional rhabdomyolysis in quarter horses and thoroughbreds: one syndrome, multiple aetiologies". Equine Vet Journal Supplement. 30: 533–8. PMID 10659313. Wiggins, Walt (1978). The Great American Speedhorse: A Guide to Quarter Racing. New York: Sovereign Books. ISBN 978-0-671-18340-0. Denhardt, Robert Moorman (1997). Foundation Sires of the American Quarter Horse. University of Oklahoma Press. ISBN 978-0-8061-2947-1. Wikimedia Commons has media related to American Quarter Horse. This page was last edited on 8 March 2019, at 05:17 (UTC).